School districts throughout the state received student test score data to determine areas of opportunities for their students. Hemet’s results showed a few subgroups of students that are underperforming. One of the subgroups that met this criterion was African-American students. However, prior to the results being released, Hemet Unified identified the need for additional assistance and began implementing a new initiative to further support our African-American students. At the beginning of this school year, staff created a council to better understand the support systems our African-American students need and barriers that affect their educational journey. The African-American Committee for Excellence and Success (AACES) began meeting once a month and started planning a way to form a similar committee at each of our sites. Before we provide this committee at other sites, we wanted to hear from our students and their families to further identify the support they need. On February 12th, nearly 100 people attended the AACES kickoff meeting. 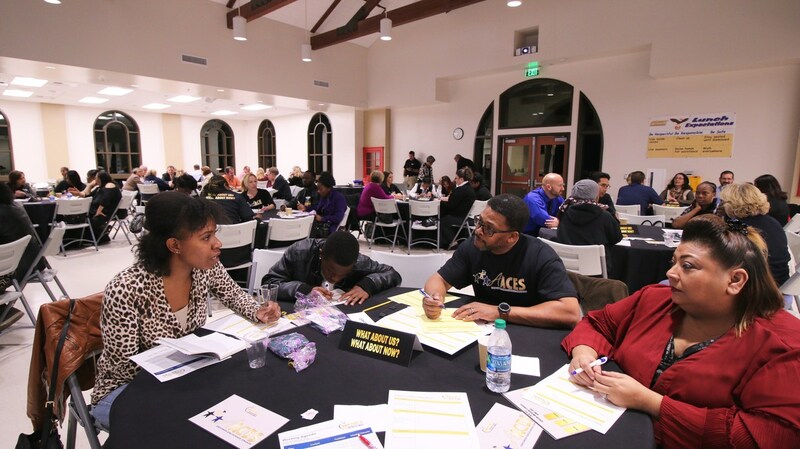 Rancho Viejo Middle School Principal and creator of AACES, Jonathan Workman, provided data of African-American students within the district and asked how families and schools could work together and ensure students are successful. Throughout the meeting staff and families were able to engage in honest conversations about barriers and challenges our students are facing and provide valuable feedback as to possible solutions. Thanks to the collaborative efforts of HUSD staff and families, and with the support of Riverside County Office of Education (RCOE), we are poised to create better and more supportive learning environments for all students! Thank you to RCOE’s Chief Academic Officer Cynthia Glover-Woods and HUSD students, families, and staff for attending the event and providing valuable input to ensure our students are set up for success. As we all know, it takes a village!